home with her. I went up town again before supper, and when I got back Tom and Ett had sat down to supper. I sat down and eat, and then putting on my things again I went over for Esther and Florence to go to the depot with me. We were again doomed to disappointment for the girls did not come. After the mail was distributed I went back to Etts and staid all night. Mr. and Mrs. McKinstry were there and we had a real social time. I was very tired when I went to bed. I had a letter from Charlie today. 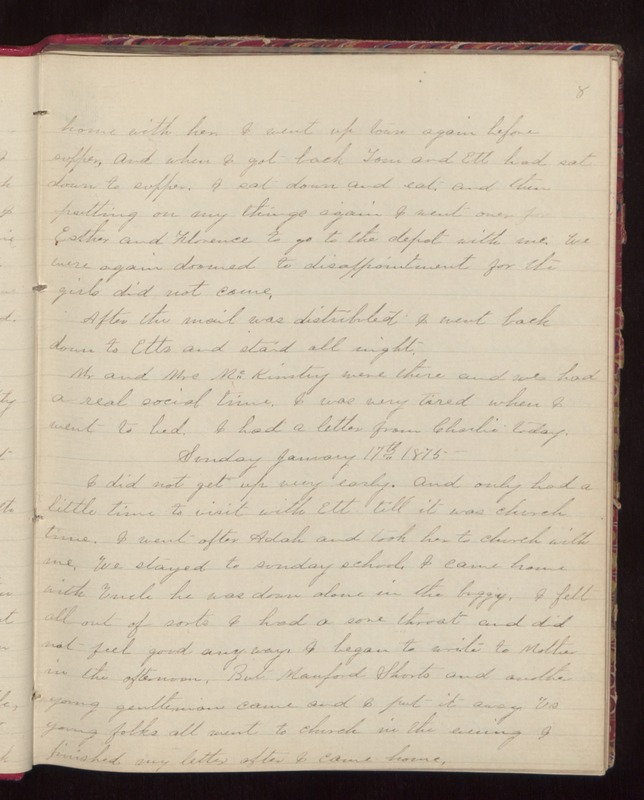 Sunday January 17th 1875 I did not get up very early. And only had a little time to visit with Ett till it was church time. I went after Adah and took her to church with me. We stayed to sunday school. I came home with Uncle he was down alone in the buggy. I fell all out of sorts I had a sore throat and did not feel good any way. I began to write to Mother in the afternoon. But Manford Shorts and another young gentleman came and I put it away. Us young folks all went to church in the evening I finished my letter after I came home.